(Bloomberg) -- Two months ago he was just another lawmaker in a congressional body that wields virtually no power. 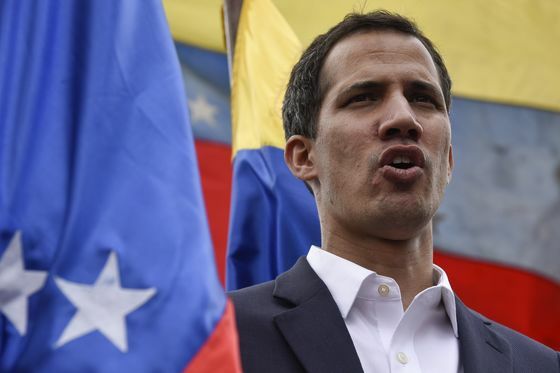 Now Juan Guaido has declared himself president of Venezuela and Donald Trump has recognized him as that crisis-racked country’s rightful head of state. As thousands marched through Caracas and other cities Wednesday to protest the authoritarian rule of Nicolas Maduro, Guaido appeared at an opposition rally in the capital. The 35-year-old is an industrial engineer by training, but he began organizing demonstrations against Hugo Chavez more than a decade ago after the late leader silenced critics by refusing to renew the broadcast license of Venezuela’s most popular television channel. Guaido formed a close relationship with Leopoldo Lopez and helped the former Caracas mayor establish the Popular Will party. Even with Lopez under house arrest, they talk several times a day. Tall and lanky, Guaido is known for his love of his hometown baseball team, the Sharks of La Guaira, and salsa dancing. Unlike many opposition allies, who are criticized for their blue-blooded roots, Guaido has humble origins. The son of a commercial pilot and a homemaker, he is one of seven children who grew up in the small port city near Caracas. In 1999, his family survived mudslides that destroyed much of Vargas and killed thousands. “Seeing your daily life wiped out from one day to the next forced us to detach ourselves from material things, but brought us closer,” Guaido told the newspaper El Nacional last month. Guaido’s partner is Fabiana Rosales, a fellow student leader. Their daughter, Miranda, named after a forerunner to South American independence hero Simon Bolivar, was born amid the 2017 wave of protests, during which her father was hit in the neck by plastic buckshot and broke his hand in clashes with police. It was just four years ago that Guaido entered the National Assembly. He became its chief due to “a series of unfortunate events” after peers were arrested or forced into exile, said Carlos Romero, a political scientist at the Central University of Venezuela in Caracas. Guaido was sworn in as the head of the assembly on Jan. 5, the week before Maduro’s inauguration for a second term as president. Maduro began the six-year term in defiance of domestic foes and the more than 60 nations that refuse to recognize his 2018 election. In his short career, Guaido has been applauded for building unity among fellow legislators. Now his challenge is to do the same across the country, channeling the desperate desire for change within the limits of a regime intent on suppressing dissent. “The situation has catapulted him into the spotlight,” Romero said. After he began pushing the Venezuelan military and foreign governments to recognize him and not Maduro as the legitimate leader, Guaido was arrested by Maduro’s secret police. Released hours later, he redoubled his call for the protests on Wednesday, a holiday commemorating the birth of Venezuela’s six-decade-old democracy.